Yesterday was one of those days when everything that could go wrong went wrong. On Monday night I was rebooting my X60 and it failed to reboot. I tried booting into safe mode but found that the boot sequence stopped at the crcdisk.sys driver. A quick search turned up a known problem with no real solution. Adjusting the registry, unplug the fan, etc seem to work for some individuals however for the most individuals reinstalling the OS was the only choice. I called IBM support, they at first gave me a driver to install, but how could I install it. I could boot in Thinkvantage mode using the hidden recovery partition, however I could not easily alter the main partitions registry or driver settings. In the end the only choice was to reinstall the OS from the recovery partition. IBM had seen instances of this issues when individuals tried to install Linux in a dual boot configuration. I never tried or would install Linux. I was resigned to rebuild my machine and was glad that all my key files were saved on a shared synced drive on the desktop I use as a server. As another safety measure, I was able to copy my user directory off to a USB drive in Thinkvantage mode. I started the recovery process, unfortunately it hung preparing the drive. Since I had run the disk diagnostics, I was pretty confident that it was not a hardware problem. I called IBM once more and they said the most likely scenario was that my drive got corrupted and they would have to send me recovery disk. I decided to try installing my MSDN copy of Vista Business. The problem is that I never purchased a CD/DVD ROM unit for my X60 or X41. I copied the Vista setup DVD to my USB driver, made the drive bootable using the utility in the boot directory. I was able to boot from the USB drive unfortunately the process hung at installing. I tried the recovery options to no avail. My thought is that the recovery partition is locked, there is an options in the BIOS to disabled it but that seem not to affect the process. I finally gave up, ordered a LaCie slime CD/DVD ROM USB unit and will wait the 3 - 5 days for the IBM recovery CDs. Since I had totally migrated to my X60, I was about to reformat my X41 and sell it. Boy am I glad I did not. When I get my X60 working again I will be sure to image it with Acronis. Updated 1/2/07 to fix PocketBreeze beta link. I received a Slingbox Pro for Christmas. It was fairly painless to install and configure. So far I am quite impressed and will write up my experience. I decided to upgrade my CD based MKIII GPS navigation computer in my BMW to a newer faster MKIV DVD navigation computer. The BMW I-Bus infrastructure has been great, it has allowed me to add iPod integration with steering wheel controls/song display and Bluetooth for my phone. The GPS upgrade will be a simple plug and play. BMW has been ahead of the game when it comes to in car electronics integration, the fact that I can upgrade my 2002 to current technology, that is just becoming available on other cars, has allowed me to continue getting value out of a great vehicle. Phatware released Phatpad 4.0 on December 19th, I will be upgrading my PhatPad 3.0 this week. It looks like they made a lot of enhancement for Tablet use. I need to finish a review of the latest version of the Bluetooth Hands Free extension by Jetware Mobile which works well with my BMW Bluetooth ULF module. I will be reviewing the new sunnysoft Backup Manager, I have been using Sprite Backup 5.1, it will be interesting to see how sunnysoft stacks up. Spectec is about to release an SDIO GPS receiver with an additional slot which I will be reviewing. SBSH Mobile Software is about to release a new version of Pocket Breeze. A public beta of version 5.2 is available here. I will be installing this week. When IBM (now Lenovo) designed their first Thinkpad Tablet PC based on Windows XP they built it in the solid Thinkpad tradition, except for one fairly critical item; the disk drive. The disk drive is a proprietary 2.5" 5400RPM 60GB drive which I have found does not perform very well. It has been the bottleneck in an otherwise excellent machine. The 2 biggest issues I have are bringing the system back up from a suspend and flipping the screen in tablet mode. Both of these activities seem to take an inordinate amount of disk access time and essentially locks up the machine. Once the drive settles down everything is fine. Back over the summer I decided to purchase Diskeeper to try to improve disk access time. Diskeeper did improve disk response time, however the scheduling mechanism left a lot to be desired. I scheduled Diskeeper to run at night, however since I am so use to suspend my machine at night the task did not run every night. Recently Diskeeper released their 2007 version. This version has made a huge difference. Diskeeper 2007 has a feature called InvisiTasking which continually defrags the disk while not impacting system resources. It really works very well and I can highly recommend it. The Diskeeper Microsoft Management Console (MMC) plug in showing the number of fragments eliminated and total number of fragments. The only problem I have is that the MMC plug in does not shut down correctly and I have to terminate it manually or it can cause XP to become unstable. Since the system runs well I seldom use the MMC and have not tracked down the source of the problem. I recently upgraded from Acronis True Image Home 9 to Acronis True Image Home 10. True Image 10 offered me some real compelling features. I perform an image backup of my 160 GB RAID 1 array in my Media Center to a 120GB Western Digital Passport USB drive. Every six months I perform a full backup, then daily incremental backups and weekly differential backups. The major problem I had with version 9 was the lack of a quota system to manage how many backups were being kept on the USB drive. Every week I would have to manually delete files to make room for new incremental and differential backups. Version 10 now has a quota feature associated with a backup location. This feature allows you to control the total backup location size, the maximum number of backups, and storage period limits. I currently have the location size set to 111MB, the maximum number of backups to 14, and the storage limit period limits. As I use version 10 and monitor space usage I will adjust the last 2 parameters to try to keep 14 days of incremental backups and 2 differentials. Another very nice feature is the email capability which emails you the completion status of a scheduled backup. You never have to check to verify that your backup ran. Very professional feature...I did find a little idiosyncrasy with the email feature, you have to surround your email address with "<" and ">". Thanks for the Acronis forum for the help in solving this issue. Version 10 also allows you to backup to an FTP location, allows for easy configuration of email/Oultook only backups, and supports Windows Vista. So far True Image Home 10 has been very stable and is a must have application for you PC. A continuing problem for the consumer with electronics is the lack of standards. Corporate competition is good for innovation and pricing, but it can also have a negative impact on the consumer. As a consumer we are left with choosing or duplicating our purchases. Case in point, my recent purchase of the Sony DSC-W70 camera. The W70 was designed with yet another flash memory card format; the Sony Memory Stick Pro Duo. In my collection I have a Compact Flash card from an old iPack, a MultiMediaCard for my Olympus digital camera, Secure Digital (SD) cards for several PDA's/ThinkPad X41, Mini SD cards for my T-Mobile MDA, Memory Stick Pro cards for my Sony DSC-P10 and now a Memory Stick Pro Duo card for the DSC-W70. It is good thing Lexar designed a small USB card reader (Trio) to read most of the formats. Clearly innovation has driven the size of the flash down and capacity up. Competition has driven the price down. All good things, however it has ended costing more since I have had to purchase cards for each new device not too competitive but good for corporate profits. 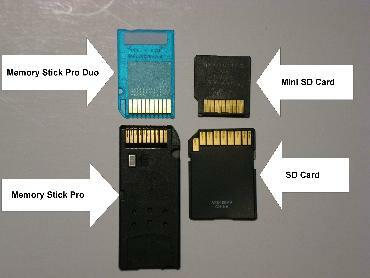 I have tried to compare devices to for flash memory card compatibility but there are always trade offs in functionality and memory card format is low on my list, probably below battery format. In this case the lack of a standard cost the consumer and in my opinion stifles competition. Memory Sticks are still more expensive per MB than SD cards which are closer to a standard and more widely used. I did find some interesting differences and similarities between the SD and Memory Stick standards. Sony made an important design choice in miniaturizing the Memory Stick, they kept the pin connections identical. This allows you to use a Memory Stick Pro Duo card with a Memory Stick Pro card reader. There is no need for an adapter, although if the Memory Stick Pro device requires that the Memory Stick Pro card be fully inserted (flush with the case), you will need an adapter to use a Memory Stick Pro Duo card. The SD format chose to miniaturize by downsizing the entire package including the pin connections. This forces the use the an adapter for all devices with standard SD slot. I found it interesting that through the translucent packaging of the Memory Stick you can see the memory chip, it seems to be about the size of the mini SD card. It would have been nice for two formats to have come up with a compromise and saved all of us consumers additional costs and choice headaches! And now here we go again with the Blue-ray and HD-DVD high definition DVD standards. I am hoping that the majority of consumers stand on the sidelines forcing a compromise between the two sides. It is funny or sad that Sony seems to always be in the middle of a consumer electronics standards fight; Beta vs VHS, SACD vs DVD-Audio, SD card vs Memory Stick, and now Blue-ray vs HD-DVD. I find Sony's technology innovations to be excellent but it seems that product marketing/design are not always in line with the consumer and they clearly are afraid of sharing with other companies. This week Microsoft made the beta 2 of IE 7.0 available here. I have been using both Firefox and IE 6.0 for a while now. I love the tabs and bookmark (favorites) organization in Firefox, although I have had a continuing problem when I suspend my system. It takes forever to resume, to the point you think the system has died. Since I am addicted to suspend/resume to save my battery I was forcing myself to shut down Firefox before suspending, which meant I lost all my current browsing content. Not a very good situation. Yesterday I decided to take the plunge and install the beta 2 of IE 7.0 on my Thinkpad X41. I am very impressed with it's stability (for a beta) and functionality. Here are some Pros and Cons I found so far between Firefox and IE7.0. I have not found any compatibility issues with IE6 sites. Opens new tab group without closing current tabs. There is always a blank tab available without having to use the menus. You can't initiate a tab group from the link toolbar, you must initiate it from the favorites view. There is no way to place an RSS feed in the link toolbar, you have to use the RSS list which is part of favorites view. I have not found a simple scrapbook tool like the one found in Firefox. If I find additional items, I will update this entry.